Most of the people believe that young children know how to read before write. However, in the view of Montessori, she recognised that writing precedes reading. I can’t tell whether her view is right or not. Nowadays, there are a lot of study on how to teach babies read! And it seems work!!! What I want to focus is on the children’ motivation on writing. In my classroom, I found that when children age above 3.5 they love to work with the metal insets to draw shapes with color pencils. It seems that they love to write very much. 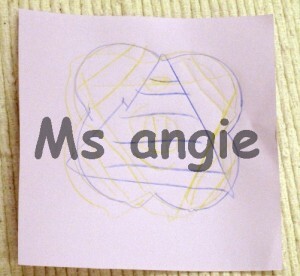 Whereas in the traditional kindergarten which I worked children had no motivation to draw nor write. One of the reasons I think becasue Montessori Environment allow children free to choose what they want to do. So when the children are ready to write which means they have good eye hand co-ordination and fine motor skill…… and they do it spontenously. So don’t force children to do things when they are not ready. Luckily, EMB has a guildlines that no writing until 4. The metal inset activites allow children to practice writing. Such as how to hold writing instrument, eye hand co-ordination. The lines are drawn inside the triangle are from left to right which let the children practice left to right reading direction.